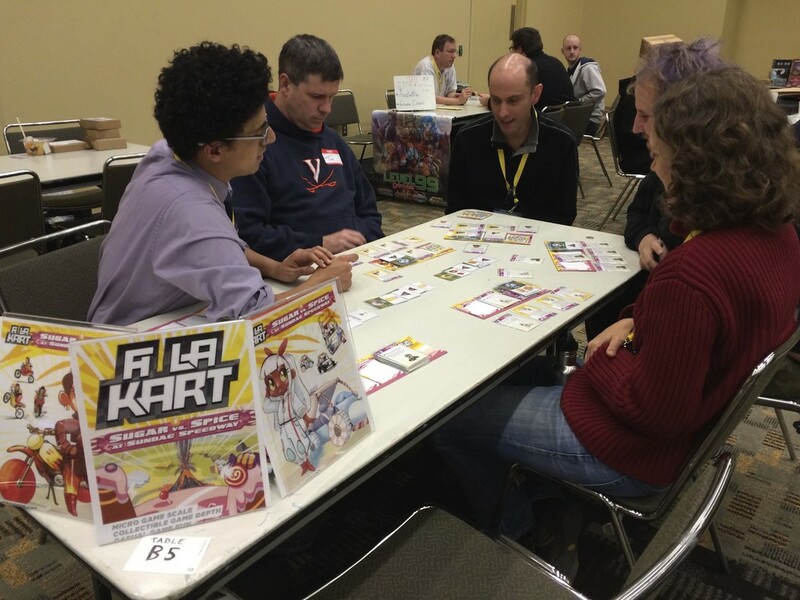 Unpub 5: Stats, photos, video and my favorite prototypes. 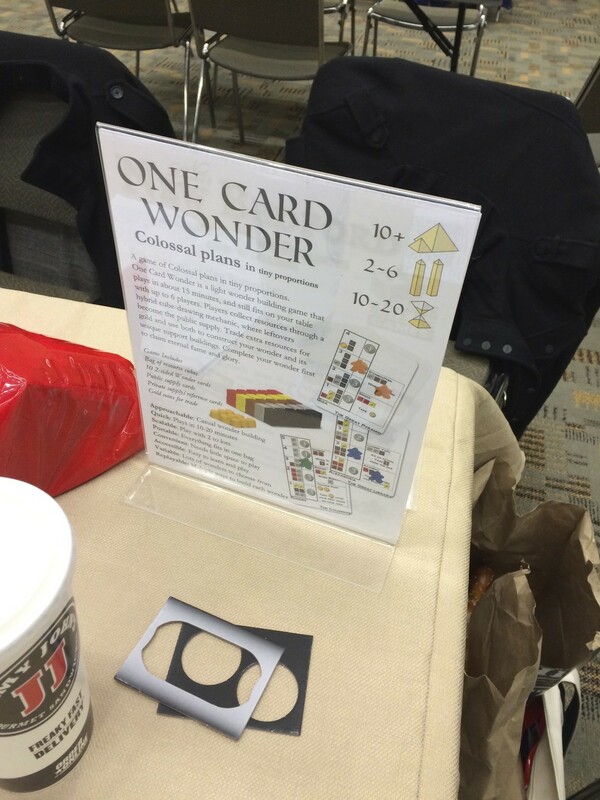 I posted my favorite photos from Unpub 5 on Flickr. I shot a 360 degree video of the two room of prototype games that make up Unpub Sunday afternoon when the show had calmed down. It was big. Bigger than I expected and very busy. I was on California time and stayed up late Friday. I didn’t set up my Table on Saturday until after noon. By then the convention center was swimming with players. I ran games back to back almost non-stop for hours. Almost no waiting around for players. At the peak on Saturday, every table was filled with play testers and people were walking around looking for an open table to play games at. It was the most epic prototype event I’ve ever seen. Friday was designer day. I attended two of the three panels and was sorry to miss the third one, but I had to make a trip to the drug store before they closed. My goal for Friday was to play other designer’s games and give away more time than I asked for. Think Seven Wonders as a micro game in 15 minutes. This one will need a lot of tuning to balance, but if Nat pulls it off it will be an fantastic little game. This is a family game with some smart mechanics. It has clever simultaneous movement and solid game theory. The version I played was super early. I expect it will turn out to be a great game for casual players or for a quick game to play on lunch. As a former competitive TCG/CCG player and designer, this game hits all the right notes with me. I have seen and played many designer’s attempts to capture the fun andy style of Mario Kart in a table top game. Nothing I’ve played comes even close to what Daniel has achieved in A La Kart. I want to play it again RIGHT NOW. I can not wait to buy this game. I tried to talk Daniel into making me a remote blind play tester for the game with my old TCG/CCG development team. I’m counting the days until this is released. I’ll buy at least four copies.